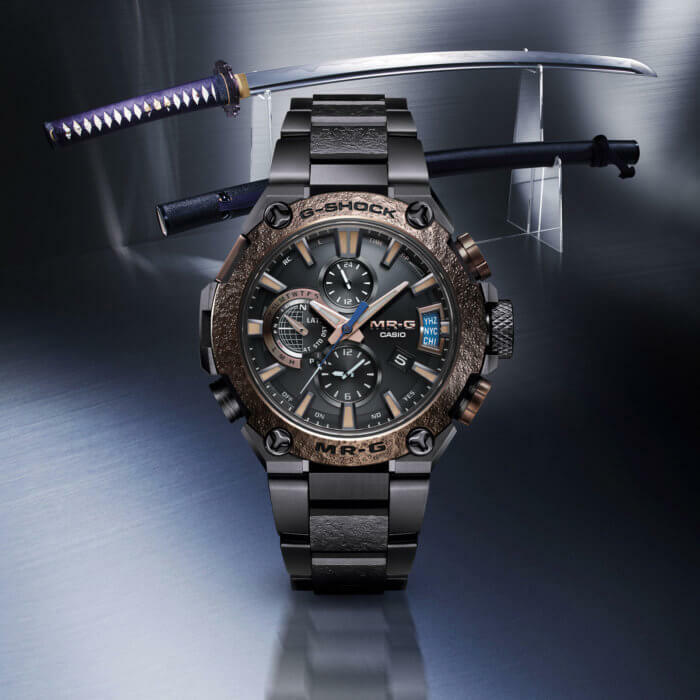 Like previous special edition MR-G models, this year’s premier limited edition G-Shock watch for Baselworld 2018 combines top of the line G-Shock technology with traditional Japanese ancestry and craftsmanship. The MRG-G2000HA-1A is inspired by the “tetsu-tsuba” of Japanese swords. Tetsu-tsuba are the forged iron plates that guard the hands above the handle of the sword and often have intricate designs carved into them. The bezel and inner band sections of the MRG-G2000HA-1A are designed in the image of tetsu-tsuba. 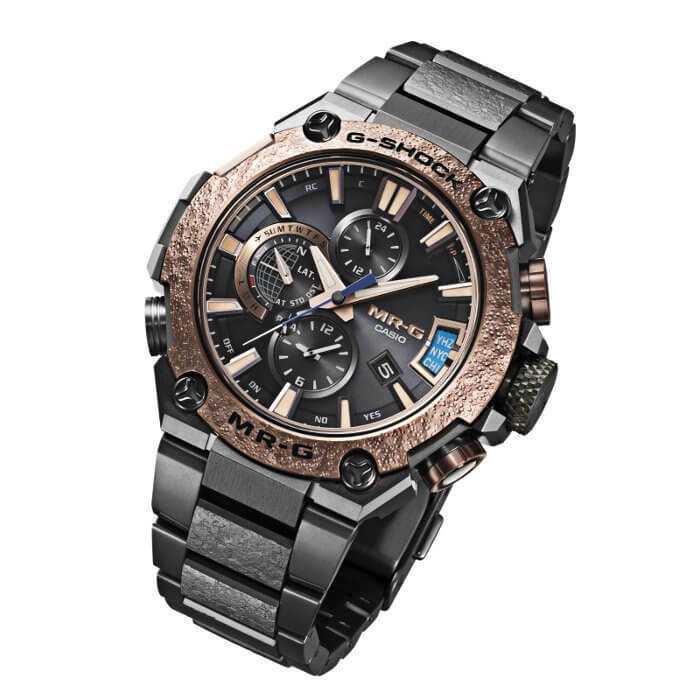 They are handcrafted in collaboration with Asano Biho using the “hammer tone” technique similar to that seen on previous special edition MR-G watches, but with a unique pattern on this model. The result is a striking bronze bezel with a traditional Japanese texture. The case and band links also receive a special coating treatment with Arc Ion Plating (AIP) by Kobe Steel, resulting in a deep gunmetal-like color and a deep-layer hardening for high abrasion resistance. The colors of the watch are based on the aesthetic quality of “murasaki-gane” (deep violet metal) and “suaka” (copper). The result is a distinctive regal look that exudes strength and pays homage to Japanese craft traditions. 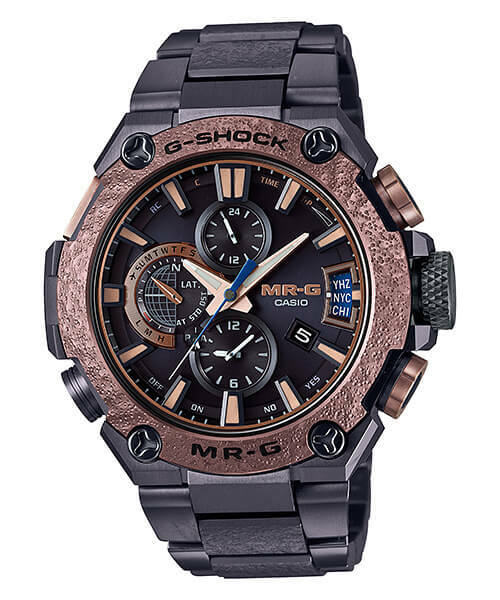 The base is the all-analog MRG-G2000, the top G-Shock model featuring Tough Solar and the ability to automatically sync the time in three ways with Multi-Band 6 radio waves, GPS time signals, or a Bluetooth smartphone link. The MRG-G2000HA-1A has a list price of ¥800,000 JPY and is limited to 350 units worldwide. Update: The MRG-G2000HA-1A is a June 2018 release in Asia. Casio America announced the MRGG2000HA-1 for a July 2018 release with a list price of $7,400 USD. Great, fantastic amazing but… where to buy it ?! Check with your nearest authorized dealer, but this model might be hard to find because it is so limited.